You can spend days discovering the many diverse Wisconsin Dells attractions, although the Dells is best known for its amazing and distinctive water parks. 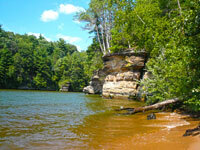 The Dells has always been a city-wide amusement park as well as a water ride destination fun spot. While there are endless possibilities for great things to do in and around Wisconsin Dells, the following guide narrows the list down to the top fifteen Wisconsin Dells attractions. This two-part series focuses on the best handpicked Wisconsin Dells attractions, but if you’re looking for something different, then check out the Wisconsin Dells water parks guide along with the highly acclaimed Wisconsin Dells indoor water park “Top 7” list. Timber Falls Adventure Park is a collection of rides and attractions that are clever and thrilling. A premier rollercoaster, the Hellcat will have you towering above the road and holding on for life as it catches air on every jump. Or you can take a seat on the Skyscraper ride and be prepared for a rush when the G force kicks in on the way down. Bumper boats, mini-golf, the Timber’s log flume ride and more make this one a must for fun lovers and thrill seekers alike. Tommy Bartlett Exploratory is an interactive science center with hands-on activities, virtual reality experiences, holograms, a Russian MIR Space Station and an original NASA space capsule on display. In season, you can take a ride on the High Wire SkyCycle—the Exploratory is a must for techno buffs, science enthusiasts and, really, everyone. Rick Wilcox Magic Theater stars its namesake, a long-time master of illusion and his wife, Suzan. The show has been called funny and enthralling—as good as Vegas. The illusions, sets and presentation are of the highest caliber. Rick Wilcox is a great magician with comedy and entertainment for the whole family. Original Wisconsin Ducks and Dells Army Ducks are world famous land and water tours like none other. The Original Ducks offers an hour-long tour that covers Lake Delton, The Wisconsin River and Dell Creek and includes terrain through lovely forested glens and canyons. The Dells Army Ducks takes you on an authentic WWII Amphibious Army Duck boat through the Lower Dells Glacial Park. A ride on the Ducks is not to be missed. Pirates Cove Adventure Golf is a miniature golf extravaganza. With five different courses, and 91 original holes of mini golf, you can spend an hour, an afternoon or a day perfecting your stroke. Beautiful landscaping, pristine putting greens, a myriad variety of plants amidst waterfalls, a picnic and play area make this attraction a sure bet. Top Secret – This topsy-turvy tour of the White House puts the classified files from the basement in full view. Aliens have apparently turned the nation’s capitol upside down and you are taken inside for a sneak peek at the mayhem–surprising and witty. Monster Truck World is an exciting stop for watching a super Monster Truck Show or a teeth-gritting ride in a Monster Wagon. This attraction will satisfy thrill seekers of all ages. Some say it’s the most memorable Dells event of all. ﻿Well, that’s seven of the top 15 Wisconsin Dells Attractions –> here are the other eight.